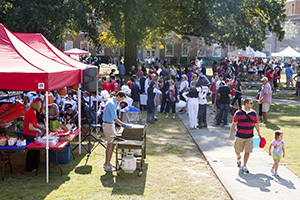 Samford University alumni were blessed with a glorious October Saturday for Homecoming 2012. Graduates from many decades and time zones brought friends and family to campus for a day of camaraderie, food, activities and football. Katie Bullock Speulda '06 and family came from their home in Oregon. "I wanted to show them the campus," she said, nodding to her husband, Nathan, an Oregon State graduate, and their one-year-old son, Benjamin, as they checked in at the registration desk. The religion major said she was looking forward to the football game and the barbecue that was promised at the Arts and Sciences tailgate tent. On the quadrangle, Cordell Harrison '63 of Fort Walton Beach, Fla., pointed excitedly to a concrete Homewood Lions Club bench. It was the same type of bench on which he had given his wife, Alma McKee Harrison '63, her engagement ring. "It was our senior year, and the bench was outside her dorm, Vail Hall," he said. They married the next year, and are now retired after careers in ministry and education. Saturday, the couple posed on the bench for photos made by his brother, Phil Harrison '68, and sister-in-law Beth Harrison, who live in Shelby County. Lee and Holly Angel Dymond, 1992 graduates back for their 20-year class reunion, arrived early to claim prime viewing spots along the parade route. The Montgomery residents were joined by Craig '94 and Lisa Stokes Hyde '93 of Hoover, whose daughters Ali, 9, and Ella Jayne, 7, were game-ready in their red and blue Samford cheerleader outfits. "There are a lot of memories here," said Lee, who hoped to see some of his former professors. The 28-unit parade was led by a large red fire truck bearing this year's grand marshals, members of the 2011 and 2012 Southern Conference women's basketball champions and coach Mike Morris. The Zeta Tau Alpha float was judged best of all the units, many of which encouraged victory over the Appalachian State Mountaineers. Samford, however, lost a hard-fought heartbreaker, 28-25. The parade was also enjoyed by Kevin Kranzlein '87, who brought his wife Kim and their teenage daughter Jessica. "I came for my 25th class reunion, and also to introduce Jessica to the campus," said the marketing and finance major from Marietta, Ga. In addition to class reunions and organizational events, this year's homecoming weekend included a few new elements that added a fresh vibe to the annual event. The School of Education's tailgate tent offered a nod to Samford's growing contingent of Chinese students. Future Samford alumnus Yifan Yan, who is pursuing a master's degree in education, helped serve "real, 100 percent Chinese tea" at the festively adorned tent. "Homecoming is an exciting activity. I have enjoyed it," said Yan, who was experiencing his first such event. "We wanted to give the Chinese students a feeling of involvement," explained education professor Jane Cobia, who had baked cookies using Alabama-grown pecans to serve with the tea. It was a blend of Chinese and southern cultures, she pointed out. Varied culinary treats were served from many other tents. Only one, however, featured a live radio cooking show with executive chef Erik Holdo, a Samford Dad whose daughter Dominique is a freshman, and on-air host Kevin Jenkins. The "Chef and the Fat Man" show has listeners in 42 states and 31 countries. Many alumni were drawn to the Samford Memories tent, where historians were collecting written and oral history for inclusion in a new history of Howard College and Samford being written by university historian Jonathan Bass. About 50 Missionary Kids-students whose parents were foreign missionaries-- returned for a series of events. Many brought family members. Brian Harper '88, M.Div. '93 of Seattle, Wash., recalled that he was one of 20 "MKs" who were freshmen in 1984, during a time when Samford often had almost 100 MKs in the student body. He and others in the Homecoming contingent made a point to visit with Jay Tolar '94, who traveled from his home in Charlotte, N.C. for the reunion. "It has been wonderful to see people I haven't seen in many years," said Tolar, who was diagnosed with Lou Gehrig's Disease in 2009. "Samford played a vital role in all of our lives." "When I got off the plane to enroll, I had never been here. But it was like I had 100 brothers and sisters," Tolar said of the special kinship that MKs feel. His parents were missionaries in Africa, where he taught for a few years between stints as a Samford student. Tim Tcherneshoff '82 agreed that MK students had much in common, "like two peas in a pod," regardless which part of the world they had lived with their missionary parents. "We were like foreigners thrown into a foreign land," said Tcherneshoff, who spent much of his childhood in Brazil. He was active in starting a Samford soccer club that was comprised mostly of MKs who had played the sport as children. Enjoying the MKs were former administrator Tom Cleveland '60, who had helped many with the admission process, and former religion professor and missionary Bill Cowley and his wife Audrey, who many MKs considered to be like parents. The Cowleys hosted the Homecoming crowd for a Saturday night pizza supper. One of the older MKs at the events was retired medical missionary August Lovegren '42, whose parents were missionaries in China when he was a student. That the MKs enjoyed the weekend was evident on Saturday afternoon when, well into the third quarter of the ballgame, peals of laughter rang out from under a tree on the quadrangle. It was a group of MKs lingering after their tailgate lunch, still recalling many good times. Guest speaker Regina Yarbrough said she wanted to focus on the contributions the alumni and others have made to nursing as a profession. "They are the foundation of the Ida V. Moffett School of Nursing," said Yarbrough, who in her role as chief nursing officer at Princeton Baptist Hospital is the recipient of many nurses who graduated from the IVM program. A Princeton employee for 41 years, she earned a master's degree from IVM in 2008. An earlier graduate, Class of 1948 member Juanita Page Lewis recalled that she attended classes in the nursing school building on Birmingham's Southside and did her clinical work at Princeton Hospital. She fondly recalls Mrs. Ida V. Moffett, the legendary nursing educator for whom the Samford school is named. "She taught our nursing ethics class, and was a very sweet lady," said Lewis, who joined the BBH faculty in 1955 after earning a bachelor's degree in nursing from Peabody College in Nashville, Tenn. She also taught at Samford until she retired in 1985. Nursing graduates also enjoyed a gala banquet at The Club on Saturday evening. Members of classes of 1962 and earlier began Homecoming weekend with the traditional Golden Bulldog brunch on Friday. Held under tents on the campus quadrangle for the first time, the festive event offered a special view of campus and Shades Mountain in the distance. Recipients of this year's Lockmiller Award as the male and female representing the earliest classes present were Sigurd Bryan, Class of 1946, and Patti Mullins Donaldson, Class of 1949. Both are from Birmingham. Music and worship played a role in beginning and ending events of Homecoming 2012. A choral vespers service on Friday night featured a time of participatory sung and spoken prayer led by the A Cappella Choir and other Samford musicians. On Sunday afternoon, the annual Samford Hymn Sing offered a compelling closure to the weekend. Many alumni were joined by members of the community and area churches for a time of congregational hymn singing with special music from the University Chorale. Much of the program involved hymn requests from the congregation. Afterwards, 1973 alumna Lynn Hazlegrove Stepleton said that one requested selection in particular, "There is a Sweet, Sweet Spirit in This Place," holds a special place in her heart. "It was popular during our college years in the seventies," said Stepleton, who remembers singing the hymn during Christian Emphasis Week and other college programs. She attended the event with her husband, Stan Stepleton '73, and her mother, Anne Hazlegrove.